Russian aviation site "Wings Palette" has some great pictures of the Dornier Do J Wal in various livery schemes. Browse through the gallery and you'll see there was a huge amount of variation in hull and engine configurations over the lifetime of the aircraft. This particular plane is representative of the Wals used by Chile for exploration and mapping missions over the southern part of the country. This closeup shot gives you a better look at the nose of the plane. 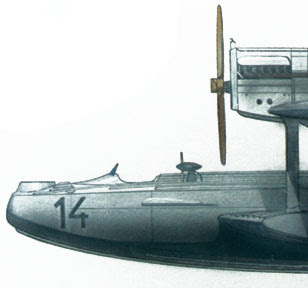 That small propeller pod attached to the hull is an air driven generator for the radio set. Like the planes from "At the Mountains of Madness" this model was intended for very harsh and cold conditions. What's interesting is that the aircraft isn't sealed, a trait it shares with the planes used on Amundsen's arctic flight. Why would you expose the interior of a cold weather aircraft to frigid open air conditions? The answer is condensation. Sealed metal hulled aircraft could have serious problems with water condensing and then freezing on the interior of the hull. The problem could be solved by using heat exchangers to warm low humidity exterior air and vent it inside the hull, but the equipment was prone to breakdowns and imposed a significant weight penalty. Unsealed aircraft flying over the highest mountains in the world, at the south pole? No thank you... Just send me a postcard, Pabodie. That little generator's a fairly clever addition. I hope they have a battery backup for when the plane is stationary. Did you see the HPLHS is releasing The Thing on The Doorstep as a DART? Preorders get an Asenath Waite MU student ID. The stand-alone generator on the Wal is important because the engines did not generate electricity. That meant you needed an independent power plant of some kind. The wind generator had the design so you didn’t need another motor to power it and eat more fuel. It also charged up batteries so that you could use the radio when you weren’t flying. Weight was a big deal with long-range aircraft, so even something as simple as windshield wipers was a weight gain and then you had to run power to operate them. Anybody with a small portable generator can tell you that you can’t operate too many items at the same time. Every pound of weight reduced your range and even your fuel weighed so much that it could make take off difficult. Check out long-range aircraft like the Spirit of St Louis and how they cut weight to gain more fuel capacity. That dinky plane flew across the Atlantic. If you ever see it at the Smithsonian, you’ll be amazed at that tiny, fragile craft.